Goodreads: Every summer, Rose goes with her mom and dad to a lake house in Awago Beach. It's their getaway, their refuge. Rosie's friend Windy is always there, too, like the little sister she never had. But this summer is different. Rose's mom and dad won't stop fighting, and when Rose and Windy seek a distraction from the drama, they find themselves with a whole new set of problems. It's a summer of secrets and sorrow and growing up, and it's a good thing Rose and Windy have each other. 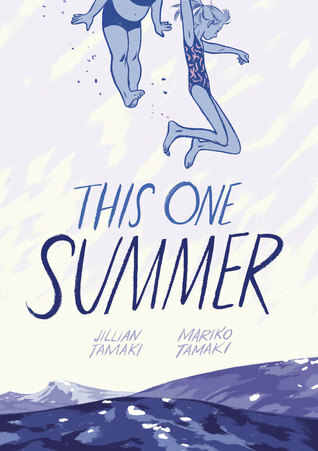 Kritters Thoughts: My first graphic novel read and I will have to say I read this months ago, but wanted to put the review up on the official first day of summer. I enjoy that as a graphic novel it read fast, but in the end I felt like I was missing something. I don't know that I would continue to read them, I might on the side when life is crazy and I need something to read that is quick and easy, but this wouldn't be my go to reading genre. I loved the topic of this one. A summer vacation and girls who are moving out of childhood innocence and into young adulthood. I am glad this is the first graphic novel I read because I did enjoy the subject and I know that if I read more the subject matter would make a big difference in my enjoyment level.